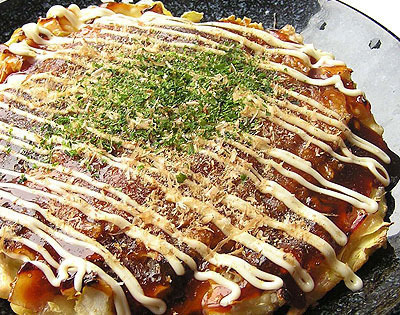 Studio Nihon: Experience Japanese culture through food, sake, and fine arts. Classes. 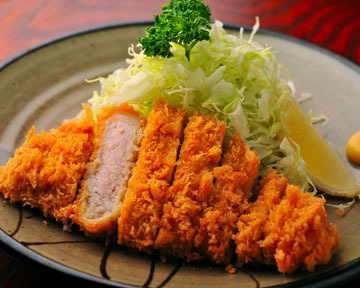 If you have four or more people, I will arrange another date on both weekday and weekend. Class will be filled in the order we receive register email and payment. Please Contact Us to register. Class might be cancelled if it does not have the minimum enrollment. Discount class pass is available $112 for 4 classes. Valid for one year from the purchase. March 3rd is "Hinamatsuri" (Japanese Doll's Festival) or "Momo-no-Sekku" (Peach blossom's Festival) This is a day to pray for young girl's growth and happiness. 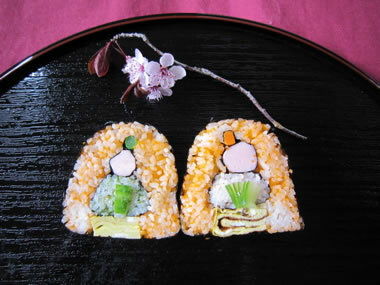 We'll make cute Hinamatsuri rolled sushi. Prince and Princess are inside the rolls. Kids welcome! You can bring own beverages to make your tasting time more fun. Class includes demo, hands-on practice, and tasting. 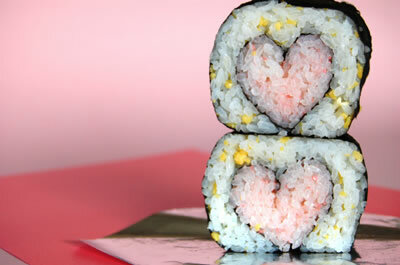 Learn the basics, create your own sushi, then eat what you created! You can bring own beverages to make your tasting time more fun. Class includes demo, hands-on practice, and tasting. This is a semi private class, possibly a private class if you are lucky! To arrange for private classes, please Contact Us. We'll bring ingredients and equipment to your location. Two-hour classes scheduled at your convenience. 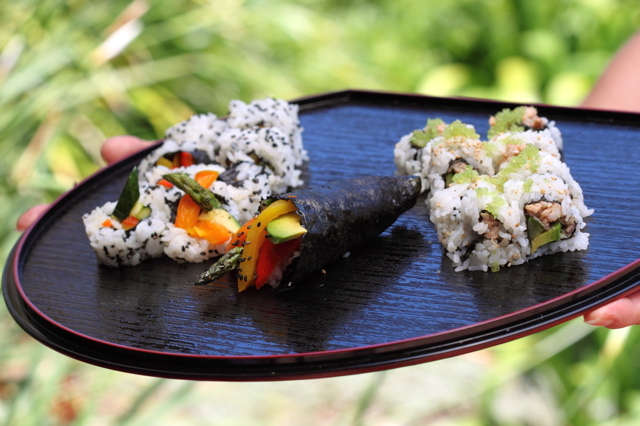 Basic Roll Course: California Roll, Vegetable Roll, Hand Roll, etc. Advanced Roll Course: Rainbow Roll, Shrimp Tempura Roll, etc. Other Sushi Course: Inari sushi, Chirashi sushi, Oshi sushi, Temari sushi, etc. Pick the dishes you'd like to learn! 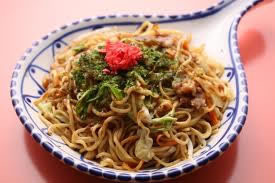 Popular menu ideas include miso soup, tonkatsu (breaded pork cutlets), karaage (Japanese style fried chicken), korokke (croquets), okonomiyaki (Japanese-style crepe with vegetables and seafood or meat), nabe (Japanese hot pot), yakisoba, agedashi dofu (lightly deep-fried tofu in broth), tempura, teriyaki, tamago yaki, gyoza. etc. * Class fee may vary depending on the menu. Please Contact Us for details. Copyright © 2012 Studio Nihon. All rights reserved.